Chop bacon into smaller sized peices and cook in a frying pan until crispy. Remove from pan and pat dry. Set aside until ready to use. 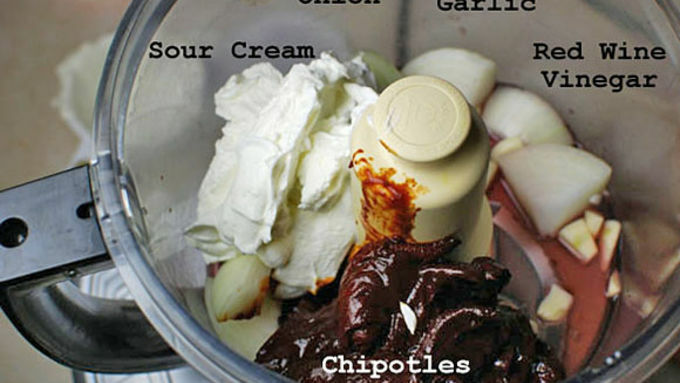 Place all the dip ingredients into a food processor with some salt and process until smooth. Refrigerate until ready to use. Cut the potatoes into 1/4 inch wide rounds. 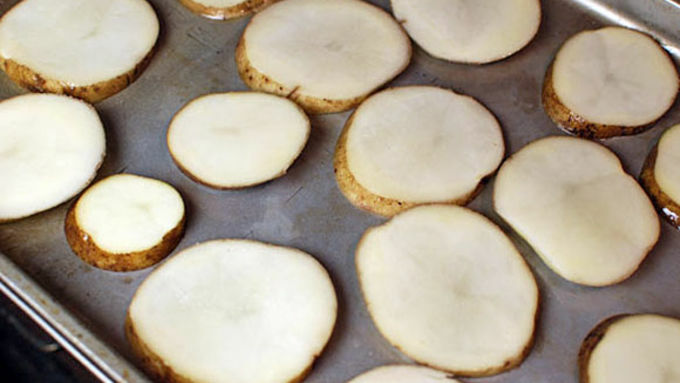 Lay out on a baking sheet and toss with oil and salt. Bake at 500°F for about 8 minutes. Flip and repeat. The potatoes should be tender, and slightly crisp on the edges. Let them fully cook until ready. 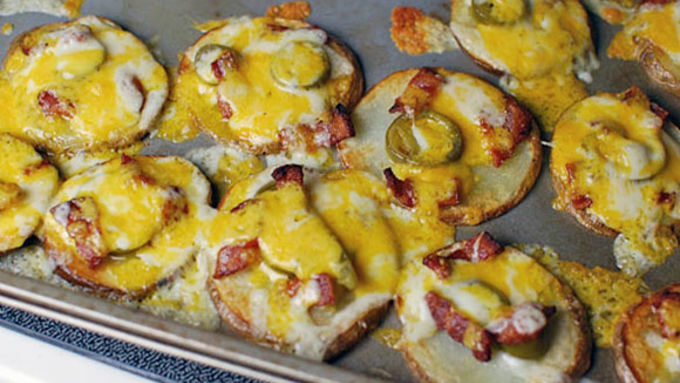 In the same pan, top the potatoes with bacon, jalapeno slices, and cheese. Place back into the oven until the cheese is melted. Remove from oven and stack onto a serving plate. Whether it’s something to bring to a holiday party, a yummy bite during Sunday’s big game, or even just a nibble to hold you over between meals, there is no denying the need for hearty snacks in the month of December. 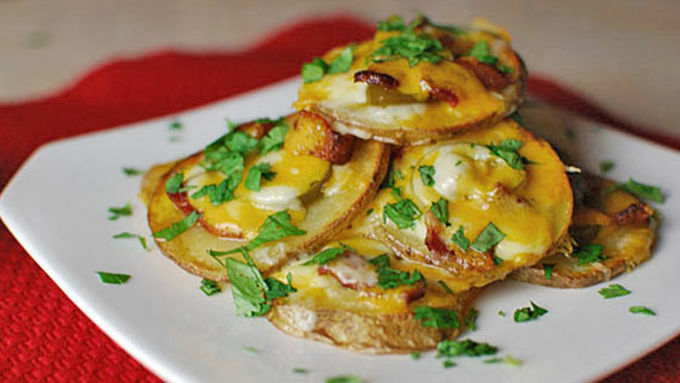 Never fear, these easy potato bites are to the rescue! Today’s snack is Spicy Bacon Oven Chips a treat that is sure to satisfy any snacking situation. They have all the elements I look for in a perfect snack: Oozy cheese, salty bacon, and just the right kick of heat. I like to stack them up like potato nachos. 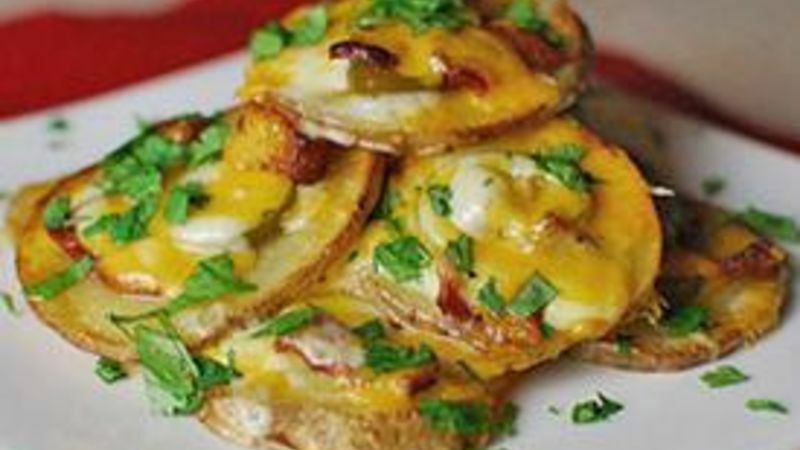 The creamy yet fiery dip is the perfect fit for the soft potato!